When Charlie Allen came to Cambridge from Washington State in the 1960s to attend Harvard, he was struck by the architectural richness and diversity of the city’s streetscapes. Raised by a do-it-yourselfer, he wasn’t afraid to pick up a hammer and soon found himself working nights and weekends as a contractor, renovating and restoring period homes in the neighborhood. In 1978 he founded Charlie Allen Renovations. In 1999, Charlie hired Julie Palmer as the growing firm’s Office Manager. Julie quickly set about identifying and systemizing the company’s best practices, from customer relations to construction methods. Over time, she developed the thorough process — from planning to project completion — that defines every Charlie Allen Renovations project, and she was named the company’s Director of Operations. She served in leadership positions with the Builders and Remodelers Association of Greater Boston and with the Eastern Massachusetts chapter of the National Association of the Remodeling Industry. In 2013, Julie was named President of Charlie Allen Renovations, a position that has allowed her to ensure that the firm continues to adhere to the industry’s highest standards on both the job site and in the office. Working side-by-side with Charlie Allen, Julie developed her keen eye for detail and honed her ability to think outside the construction box for solutions. Today, Julie’s favorite part of her job is working closely and thoughtfully with clients to achieve the most successful outcome for their remodeling or restoration project. Nortoh grew up on the small Caribbean island of Dominica. He moved to the United States in 2000, when he began working in residential construction. He particularly enjoys finish carpentry: measuring, building, and installing interior features like cabinetry, moldings, shelving, trim, and more. Nortoh lives in Dorchester and is the father of two children. In his spare time he enjoys listening to music and building his own custom speakers. He has worked with Charlie Allen Renovations since 2013. Todd has been working with his hands since 1990, when, after graduating from high school, he took a job with a high-end homebuilder in Connecticut, and later apprenticed with a roofing company in Hartford. An outdoor enthusiast, Todd studied outdoor recreation and business administration at Plymouth State College, and spent several years teaching rock climbing, mountaineering, windsurfing and skiing before turning his attention back to homebuilding and launching his own construction and roofing company, which he successfully operated for seven years in Connecticut and then another seven in Massachusetts. 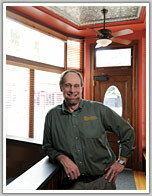 Todd has worked at Charlie Allen Renovations since 2009. In his spare time he enjoys hiking, fishing, and spending time with his children. Lisa has been a fan of design and home renovation for years and enjoys working with Charlie Allen Renovations’ clients to assist them with product and materials selections. She received a Master of Tourism Administration, Meeting and Event Planning from The George Washington University School of Business in Washington DC, and once lived in the Cayman Islands. Lisa lives in Cambridge with her husband, two daughters, and dog, and in her free time, enjoys running, traveling, and reading. Ron began working with Charlie Allen Renovations in 2015, long after he’d first worked with the company as a client. He previously worked as Director of Rates & Budget for the Massachusetts Water Resources Authority (MWRA), as Budget Director and then Assistant Commissioner for Management Services at the Massachusetts Department of Public Health, and as a Budget Consultant for Babson College. He and his wife live in West Newton in a mid-century modern house. Mark has more than 20 years experience in home building and restoration. While in college getting his business degree, Mark began building and siding houses. After graduation, building was in his blood and he started his own company, Apple Tree Builders. After running his company for 10 years, he came to work for Charlie Allen Renovations in 1998, a company that shared his values, high standards and commitment to customer service. At Charlie Allen Renovations, Mark is responsible for project development and enjoys working with homeowners to create a project that fits their need and their budget. Mark received national Green Remodeler certification from the National Association of the Remodeling Industry (where he has also received certification as a Lead Carpenter and as a Remodeler), and completed CAPS (Certified Aging in Place) training with the National Association of Home Builders. Mark has a bachelor’s degree in marketing from the University of Massachusetts, Boston. When not busy at work, you will find Mark hitting the ski slopes or golf courses and spending quality time with his family. Alex began working in the remodeling industry in 1998, and soon learned that he enjoyed nearly all aspects of home renovation and restoration work. His favorite projects are kitchens, where he can help clients achieve very personalized spaces that are both functional and enjoyable, and decks for gathering and entertaining. In his part-time, Alex loves to bass fish, and he and his wife also breed and show champion French mastiffs. He and his family live in Fitzwilliam, New Hampshire.